Popular burrito brand Boojum offers fast casual dining with a funky Mexican feel and a lively atmosphere. Mexi-Cali style burritos, fajitas, tacos and nachos are waiting to be washed down with a selection of speciality beers and Mexican soft drinks. 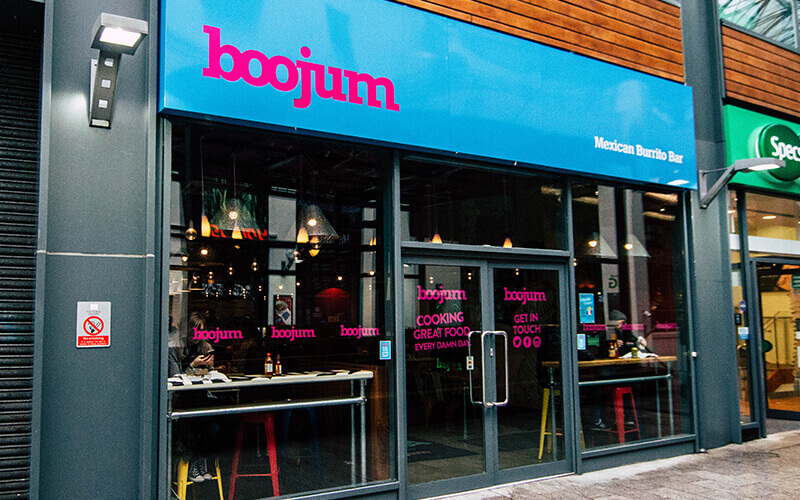 Famed as the first burrito bar in Ireland, Boojum first arrived on the scene in 2007 and has since opened stores across all of Ireland. Popularity for the brand has risen to cult like status with a highly loyal following, identifiable by their highly coveted ‘Boojum Addict’ t-shirts, many going as far as eating Boojum on an almost daily basis! The concept is simple – fresh, authentic, award winning food at great prices, cooked in-house, every damn day! Not a freezer or microwave will be found in any Boojum.